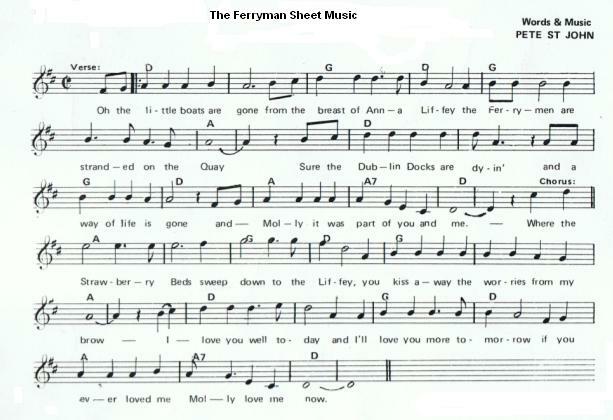 The Ferryman Irish Sheet Music. Words And Music by Pete St. John, first recorded by The Dublin City Ramblers with Patsy Watchorn doing the singing, when Patcy joined The Dubliners he brought the song with him. Next to The Rare Auld Times this is this one is the second most popular Dublin songs. There's a riff that's usually played as an intro but it's not included in the sheet music, it must have been added at a later stage. The tin whistle player in the youtube video is Jean-Baptiste Meynard and is playing The Ferryman using the same notes as the sheet music.